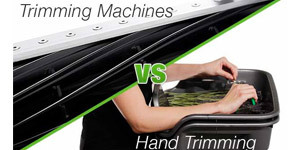 Although machine trimming does not always produce the perfect quality that hand trimming can, it has many benefits. Depending on the size of your garden, using an automated trimmer can make a huge difference in productivity and efficiency. Read our blog on the pro's and con's of each style and why a trimming machine can be a savior for your next harvest. After you harvest your plants, you need to remove excess moisture from the buds. Doing so effectively will set you up for a successful cure. What is a harvest drying rack? A harvest drying rack is a multi-chamber mesh container. It has multiple levels for storing buds, and is the best way (usually) to dry your buds. The alternative is hanging buds by their stem in the growing room or tent, but this takes up a lot of space. If you are harvesting multiple plants and don't have a lot of space, a harvest drying rack is the best option. If you want to set yourself up for the most effective drying and curing process, consider a complete harvesting, drying, and curing kit. These include a grow tent with ventilation and odor control, a drying rack, a curing kit, trimming scissors, extraction equipment, storage jars, hygrometer, and more! Get the best bang for your buck with one of these kits. How long should I dry my buds for? You should dry your buds out for 5-10 days in a controlled environment in your drying rack. Do not rush this process, because you will be compromising quality. Be patient and allow moisture to leave the buds at a controlled rate, and you will be rewarded with a flavorful, aroma filled final product! Environmental controllers – These will monitor your temperature and humidity, and activate systems that control your environment e.g. a dehumidifier. Should you end up drying out your plant material too fast, you can purchase humidiccant packs. These will help rehydrate buds when you move on to the curing stage. If you can, it’s always a great idea to hang your drying rack in your grow tent as temperature and humidity are much easier to control in them. What will drying your buds after harvest do? Breaks down chlorophyll improving taste and removing grassy taste that disguise the true flavor. For more information on why you should use a drying rack after harvesting, check out our full guide on drying buds. If you have any questions, our expert growing staff is available at 888-815-9763. STACK!T Drying Rack With Clips, 3 ft.
STACK!T Drying Rack With Clips, 2 ft.
STACK!T Flippable Drying Rack With Zipper, 2 ft.
DL Wholesale Stackable Square Drying Rack 27" x 27"